Inspired by the official U.S. Ski Team mascot Champ, the Team kicked off a content series asking athletes and fans about the moment they truly felt like a champion. 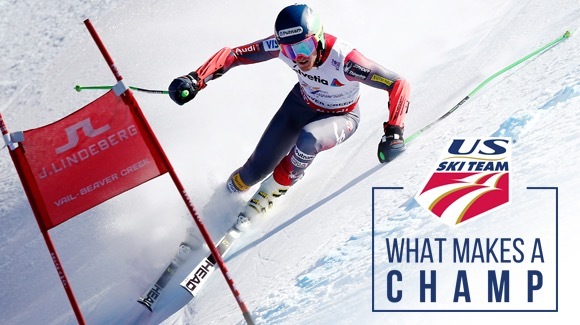 Hundreds responded using the hashtag #WhatMakesAChamp to try and win a trip to the NASTAR Pacesetting Trials at Copper Mountain to race Olympic champion Ted Ligety. #WhatMakesAChamp #tedligety #usskiteam Auden Pankonin 8 Hudson, Wi - US Ski Team "What makes a Champion"
Auden is the lucky winner of a trip for three to Copper Mountain to race in the NASTAR Pacesetting Trials with Ted Ligety on November 21st, round-trip tickets to Colorado, transportation, two nights lodging in Copper's Center Village, three two-day lift tickets, an official U.S. Ski Team uniform and a VIP swag bag. Colin will receive official U.S. Ski Team outerwear from Spyder. Check out his entry below. Dasha snagged an official U.S. Ski Team hoodie, t-shirt, and hat. Due to U.S. Ski Team athletes’ training schedule and warmer weather in Colorado, the date of the U.S. Ski Team’s annual Nature Valley First Tracks celebration and Putnam Investments NASTAR Pacesetting Trials was pushed from November 6 to November 21. The day of festivities will be hosted by three-time Olympian, U.S. Ski Team alum and NASTAR pacesetter Daron Rahlves and two-time World Champion Chris Davenport. Congratulations to all that entered the #WhatMakesAChamp contest! Share your story throughout the 2015-16 season by telling us what makes YOU a champion on Facebook, Twitter or Instagram by using the hashtag #WhatMakesAChamp for a chance to be featured amongst your favorite U.S. Ski Team athletes. Skiing always comes first for 2006 and 2014 Olympic gold medalist and five-time World Cup giant slalom champion Ted Ligety. Whether it's dropping cliffs, taking the snowmobiles into the Utah backcountry or laying down some of the most incredible angles in all of ski racing, "Shred" is constantly pushing and evolving the sport.